It's twilight time: Our dawn-till-dusk palette features an array of colors for lips and eyes - all in a mirrored compact (that's perfect for giving). Ten eye shadows in mix-and-match textures create shimmering, light-catching looks that are complimented by four shades of Creamy Lip Color. Includes mini versions of our lip and eye shadow brushes so you can make-up wherever you go. I love the neutral colors in here :) Bobbi has such great taste in assembling pallettes. Love the colors! Really pretty. Nice post and beautiful colors for the fall! 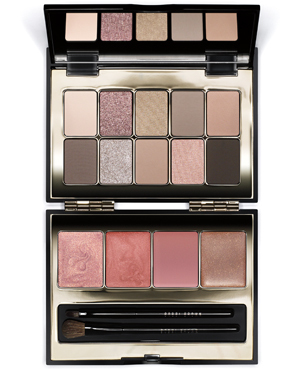 Bobbi Brown has such great products! These colors are GORGEOUS! Lovely blog dear! I'm your newest follower on FB (under Ashley Babb), Bloglovin and GFC! Gorgeous shades! thanks for sharing, I dont really know whats new on the high end makeup brands.